Jeff Chang has a great article on Salon.com about the history and culture of kickass, world-class b-boys in Korea: So you think they can break-dance? In a very recent, short span of time, South Korea has emerged as an international b-boy powerhouse. 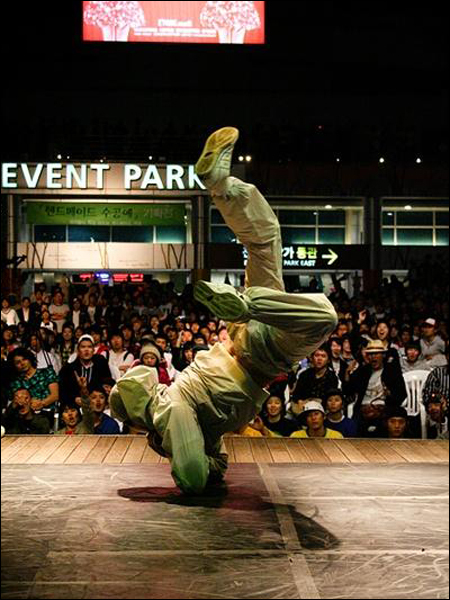 It may have started in New York City, but the Korean b-boys have taken it to another level. It's a good piece looking at how this phenomenon came to be. Now that shows like So You Think You Can Dance and America's Best Dance Crew have hit a certain level of public consciousness in the U.S., it would be cool if the producers of such shows started looking abroad to raise the bar. How cool would that be? Randy Jackson Presents The World's Best Dance Crew. Yeah, don't expect it to happen.